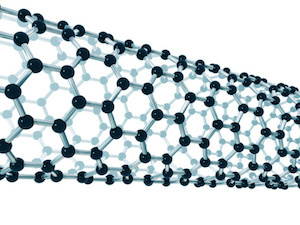 Recently, the National Institute for Occupational Safety and Health recommended new workplace safety standards for exposure to carbon nanotubes and carbon nanofibers. Carbon nanotubes and carbon nanofibers are materials visible only with very high-powered microscopes. Their size gives them properties that scientists have found to have useful industrial applications. For example, carbon nanotubes, carbon nanofibers and many other types of nanomaterials are being used in the manufacture of products such as plastics, paints, ceramics and textiles to increase versatility and strength. These materials have been found to enhance heat resistance and make products more long lasting. However, there have also been concerns about the risks to workers from exposure to these nanofibers. There have been worries about respiratory hazards and the development of occupational illnesses from long-term exposure. The National Institute of Occupational Safety and Health has recommended that exposure to airborne nanofibers be limited to a maximum of 1 mcg per cubic meter of air to reduce the risk of lung damage from exposure. The institute also recommends that workers be trained in the safe handling of carbon nanotubes and carbon nanofibers, as well as the use of strategic handling measures, to reduce cross-contamination within a facility. It also recommends that employers establish proper health surveillance and screening programs to identify early signs of exposure and to detect signs of respiratory disease or other signs of occupational illness.